​A gift that makes a difference… Most of us had barely digested our Thanksgiving turkey when Richie McDonald, former lead singer of Lonestar, was already feeling the Christmas spirit. For every copy of his If Everyday Could Be Christmas album purchased in 2009 he donated five dollars directly to the Loretta Johnson Medical Fund. Loretta was one third of Nashville’s most beloved trio; the Johnson Sisters - Loudilla, Loretta and Kay. The sisters were the founders and co-presidents of the International Fan Club Organization (IFCO), the only fan club monitoring organization in the world. They were the dedicated voice of the fans, and the artists, for more than forty-five years. Loretta, and her wonderfully sweet and kind sisters, had been giving to others throughout their lives and after 2005 the tables had turned. Loretta's long battle with cancer depleted their insurance and nearly all of their other resources. They had reached a place where they needed to be on the receiving end of the kindness and compassion they had shown to others all those years and McDonald made it so easy for YOU to help them. This album still is the perfect stocking stuffer for everyone on your Christmas list. McDonald, who was honored in 2002 with the BMI Songwriter of the Year Award for "I'm Already There," and contributed on many of Lonestar's biggest hits, has put his own stamp on a few Christmas classics and four new songs on which he co-wrote. Although he did not write the title cut, there will be no doubt in your mind when you hear it, that he was feeling the Christmas spirit when the song was recorded and in keeping with holiday traditions which focus on family and home, Rhett, Mollie and Maise, McDonald's three children, appropriately lend their singing talents, and delightful laughter, to the CD on "Why Santa's Fat." "not sugar plums and bubble gum / oreos or none of that / santa’s just so full of love / and that’s why santa’s fat." The laughter, alone, of the children on this track is guaranteed to lift your spirits and get you in a holiday mood. "Coming Home For Christmas," co-written with Victoria Shaw and Jim Brickman, is lyrically compelling and passionately delivered and "Christmas Lights," co-written with Ron Harbin, is another cut with captivating lyrics and a fluid melody. The fourth song that McDonald co-wrote on is the final cut, "Miracles Happen;" co-written with Gary Baker and Christian author Karen Kingsbury. This cut will be featured in her upcoming movie, Gideon's Gift. 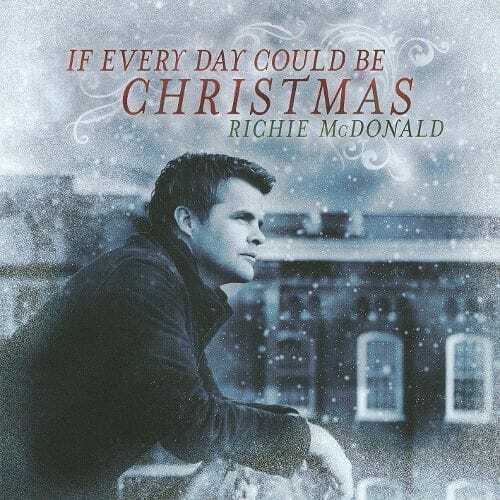 All four of the songs McDonald had a hand in writing, possess all the right ingredients that could easily garner them a spot on the list of Christmas classics and the album also includes the existing classics of "White Christmas," "Most Wonderful Time of the Year," and "The Christmas Song." That about does it; life surely would be good If Everyday Could Be Christmas.